Imagine a New Jersey where every resident can walk out his or her door and access an interconnected system of parks, trails and protected natural areas, farmland, and historic places. This idea moves closer to reality through Garden State Greenways, New Jersey’s dynamic online planning tool. Garden State Greenways is a tool for all those involved in conserving open space, farmland, and historic areas. Garden State Greenways identifies hubs - larger areas of undeveloped land with important natural resource values - and linear connectors between these hubs. 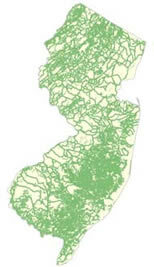 Garden State Greenways provides a statewide vision, suggested goals, detailed maps and powerful Geographic Information System (GIS) data and planning tools to help coordinate efforts of private groups and government agencies. A collaborative planning tool. With it, New Jersey communities can coordinate and plan for open space systematically and cooperatively, across county and municipal boundaries. A synthesis of information. It provides a statewide vision, suggested goals, detailed maps and powerful planning tools. as new information becomes available, and it can be used and customized by government agencies or private groups. An interactive statewide map of undeveloped lands (forest, farmland and wetlands hubs) and potential connectors. Map-based information to assist in open space planning on the local, county, regional and statewide levels. that currently have an open space plan. open space planning and preservation. © 2012 New Jersey Conservation Foundation. All Rights Reserved.